The principle behind Dr. Yates Keratin Fiber Hair Enhancer is simple: make one hair do the job of three. Achieving that objective is where science and experience come in. By adding a multitude of protein fibers to each strand of your natural hair, we effectively make every hair larger and fuller, and the concentration of hair over the entire scalp becomes denser and thicker looking. Our thickener starts with natural keratin filaments that are as close as possible to the composition, texture, and appearance of real human hair. We then magnetize those replenishing fibers with static energy, allowing them to firmly adhere to any type of hair. The result is a natural, dependable hair thickener that can be applied quickly and evenly over almost any thinning area to achieve a fuller-looking head of hair instantly. Even areas with major hair loss can benefit significantly from Dr. Yates Hair Thickener because the energized fibers are designed to attach themselves to even the smallest and finest hairs—including the ones you may not be able to see. This also makes it ideal for thickening and defining eyebrows and facial hair. 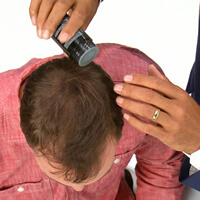 Application is as simple as a gentle shake over the thinning area. 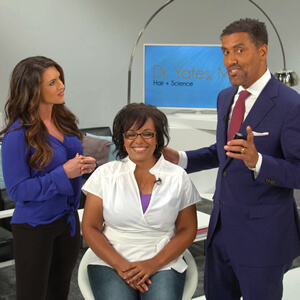 Dr. Yates Hair Thickener is completely natural, formulated in eight colors, and won’t damage hair or scalp because it remains on the surface and can be easily washed out with shampoo. Since it adheres directly to your existing hair, it stays in place all day—even in strong winds and rain or through the sweat of a workout. 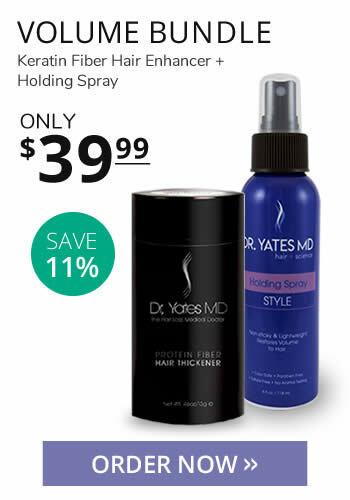 It’s durable, undetectable, and colorfast, but for even greater staying power, finish off with Dr. Yates Holding Spray.